TCW promotes the devotion to the Holy Face. Ven. Pius IX said, “This salutary reparation to the Holy Face of Jesus is a divine work, destined to save modern society.” Pope St. Pius X expressed the desire that it be venerated in the homes of all Christian families. And today the Holy See in exile especially wants the Underground Church to practice the devotion to help repair the outrages against Our Divine Lord that merited this punishment (eclipse of the Church) and to hasten the Triumph of the Holy Father. 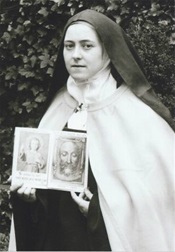 The following prayer to the Holy Face is from St. Therese of Lisieux. It is said that this devotion brought "The Little Flower" to her great sanctity. a man of sorrows", I venerate Thy Sacred Face whereon there once did shine the beauty and sweetness of the Godhead; but now it has become for me as if it were the face of a leper! Nevertheless, under those disfigured features, I recognize Thy infinite Love and I am consumed with the desire to love Thee and make Thee loved by all men. The tears which well up abundantly in Thy sacred eyes appear to me as so many precious pearls that I love to gather up, in order to purchase the souls of poor sinners by means of their infinite value. O Jesus, whose adorable Face ravishes my heart, I implore Thee to fix deep within me Thy divine image and to set me on fire with Thy Love, that I may be found worthy to come to the contemplation of Thy glorious Face in Heaven. Amen. *"The Church will be eclipsed. At first, we will not know which is the true pope. Then secondly, the Holy Sacrifice of the Mass will cease to be offered in churches and houses; it will be such that, for a time, there will not be public services any more. But I see that the Holy Sacrifice has not really ceased: it will be offered in barns, in alcoves, in caves, and underground."